People are different, but they are PREDICTABLY different. While people are all different, they are PREDICTABLY different. All of us have ways that we prefer to communicate and work on projects. In fact, there are only four basic ways that we work! Learning which of those four YOU prefer can be a real help in getting why they don’t connect with you. Learning what THEY prefer can be huge in getting their cooperation. Are you a Driver, an Influencer, a Steady worker or Conscientious? In this fun, interactive presentation, I’ll share with you how these four groups work and what you can do immediately to improve your connection with others. If you want to improve teamwork, communication and collaboration, this session is for you! I’ve shared these ideas with engineers, accountants, managers and C-Level team members – all of whom have found them helpful. This best delivered as a lunch and learn for your group. 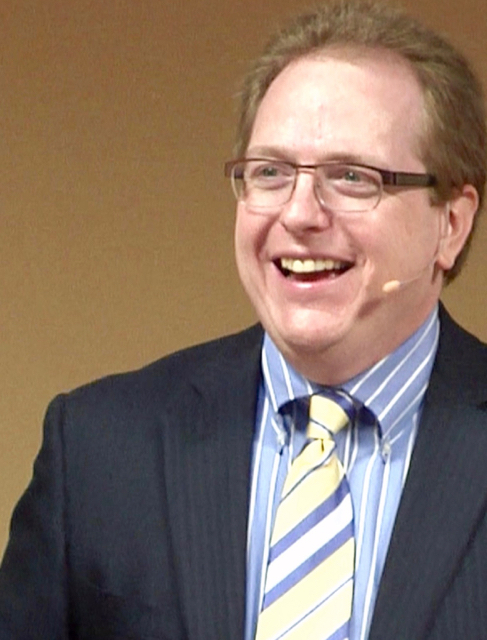 Audience members will become aware that there is more than one “regular” way of working and communicating. They will understand that “different is not wrong” and that people are predictably different. 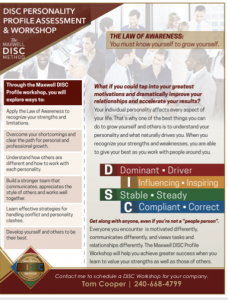 They will identify which of the DISC profiles applies to themselves, and gain skills in identifying which applies to others. They will leave with practical tools they can immediately apply. During my more than 20 years in industry, observing dysfunctional relationships at work, I searched for solutions to the problems that plague so many teams. I began to study leadership as a discipline and eventually worked to implement these ideas in large and small organizations. 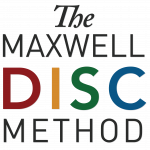 As a Founding Partner in the John Maxwell team, for the last several years I have been an executive coach working with teams in multi-billion dollar companies and have seen over and over again how implementation of these principles transforms culture and addresses key challenges that people are facing every day. Select me as your speaker and I will give you amazing effort. I'll offer you a simple process, not a project. I'll help you achieve your goals. I win when you're blown away by the experience of working with me. "I really enjoy working with Tom because he's practical and down to earth. He's very engaging, and brings good content and an entertaining presentation. I will certainly call him again in the future"
"Fast paced, engaged me, importance of connecting to get more of what I need” “I thought it was powerful"
"Highly recommend Tom to speak to your group" "Great session"
"Very interactive" - "I thought that everyone [already] knew what I needed""I really liked it" "simple, digestible" "All of a sudden I can get things done better"
"Simple, easy steps" "tools to communicate with technical staff"
"It was simple, to the point" "You really brought out a lot of different ideas"
“Tom reminded us of the things that are most important"
"Tom brought a lot of enthusiasm and new ideas" "A lot of good takeaways we can use"